Finally, we have an exciting clinical breakthrough in understanding and treatment of dry cough. Dry cough is a type of cough that does not trigger the production of phlegm or sputum. There are many different conditions that can trigger the onset of dry cough. These are inclusive of cold and infections (both of which are the top causes of dry cough), traumas, allergic reactions, airway obstruction, lung cancer, and several other abnormalities. Inflammation is a very important feature of chronic dry cough in a majority of cases. Moreover, the situation can get rather life-threatening in cases of fever, difficulty breathing, heart palpitations, chest pain, swollen legs or ankles and night sweats. In such cases, you need to acquire immediate medical help. See your health care provider in case of persistent dry cough. Dry cough is often a problem faced by people who suffer from respiratory conditions including bronchitis, asthma, emphysema, cystic fibrosis, and many others. In a majority of people, the problem typically tends to worsen during the night due to overbreathing and additional CO2 losses that reduce body oxygenation. 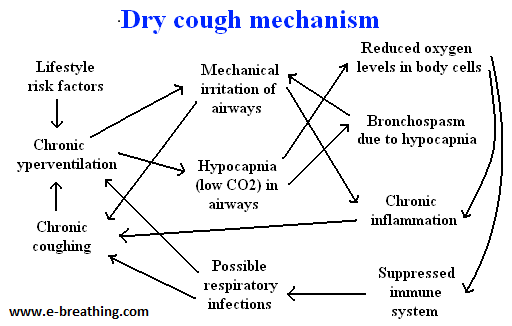 Here is the mechanism of dry cough confirmed on thousands of patients. It is rather natural for urge-to-cough nerve receptors to get irritated due to the onset of low CO2 levels in the nerve cells in airways. This is the same reason as in cases of irritable nerve states within the brain that trigger anxiety, panic attacks and a plethora of other problems. So, why is it that people who suffer from respiratory conditions suffer from dry cough? Because they have reduced CO2 levels within their airways! Considering the fact that these people suffer from chronic overbreathing (even if they do not have dry cough), and they breathe substantially more while coughing (15-20 L of air per min or more), they continue to suffer from reduced body O2 content – they commonly have less than 20 seconds for the CP test (or body oxygen test), wherein the medical norm is 40-50 seconds. Given here is an image that portrays in-depth details about dry cough mechanism and the causes of cough. Please bear in mind that CO2 deficiency has the potential to trigger spasms within all of the smooth muscles found in the human body. These are typically inclusive of the bronchi and bronchioles, whereas their constriction is called bronchospasm. Persistent dry cough is additionally caused by inflammation that appears and becomes chronic in cases where there is positive body voltage because of a lack of electrical grounding. Electrons from Earth have the potential to quench, as well as prevent the development and onset of inflammation. The basic dry cough home remedy includes a very simple and easy breathing exercise. It has been used by more than 170 Soviet and Russian medical professionals who have tried it out on thousands of their patients. They found that these patients could stop dry cough in just about 1-2 minutes using the ‘Breathe Easy’ exercise, for it helps in accumulating a bit more CO2 while being totally relaxed. Remember, this breathing exercise can easily calm down nerve cells found in the airways (the urge-to-cough receptors) and enhances body-O2 content.